Feeling run down, stressed and exhausted? Being a parent is no easy feat and it can often feel like there just aren’t enough hours in the day to get everything done. With so many tasks to complete, it can easily become overwhelming and the stress just keeps on building day after day. If you’re fed up of the constant daily battles to keep on top of everything, there is one way to make things a little easier. Carrying out certain tasks at the weekend could help make parenting much easier during the week. Sunday’s, for example, are a particularly great day to get ahead. So, if you’re ready to make a change and get back in control of the situation, here you’ll discover 5 things you can do on a Sunday to ease the pressure during the week. Seriously? How much stress could this actually save you? Well, it turns out simply planning outfits for both you and the kids can save you a lot of time, stress and frustration. How many times have you spent frantically trying to find clean clothes to get you and your little one dressed? With so many other things to focus on, it’s easy to forget to put the washing in or put away clean clothes. Having to wear the same dirty clothing because you’ve barely had time to breathe, let alone check you have clean clothes, only adds to the stress and humility of parenting! So, when Sunday morning arrives, make sure you’ve done the washing for at least the next few days. Then, organize the clothes into easy-to-find outfits. Placing entire outfits together when possible will save you a significant amount of time and hassle during the week. Now, there’s some parents who live for cooking in bulk. They take great pride in preparing their meals in advance so they don’t need to worry about what to eat during the week. However, if you couldn’t think of anything worse than spending your entire Sunday cooking, you’re definitely not alone! The good news is, there are ways to prep your meals without going all-in and cooking a mountain of food. You could simply cook “double meals” or just prepare the veggies. Double meals are basically dishes that are going to leave leftovers. So, if you’re cooking a Sunday dinner for example, any leftover chicken could be used to create a separate meal the day after. You’ll have already done the most time-consuming cooking task (cooking the chicken), so it will still speed up the cooking process. Preparing the veggies will also save a significant amount of time during the week. Often, it’s the preparation, rather than the cooking which takes up the most amount of time. So, washing, chopping and then properly storing the veggies until they’re needed is a fantastic Sunday time-saving idea. Waking up to a messy house on a Monday morning doesn’t exactly fill you with positivity and motivation. So, why not take just 30 minutes out of your Sunday and do a quick power clean? You could even set a timer and get help from older kids or your partner. Don’t attempt to clean the entire house – just focus on the most important tasks. You may find it easier to write a list of the things you feel need to get done, then tick off what you managed to do at the end. If you see it as a challenge, you’ll find it much more enjoyable and you’ll also be surprised by the amount of tidying up you can get done in just 30 minutes when you’re focused. If the house is tidier at the beginning of the week, it’s going to make you feel a lot more relaxed and happier. This task doesn’t take much time at all, yet it can make a significant difference to the week ahead. Set a little time aside to fill out upcoming appointments and events. This will give you a good idea of what’s coming up over the next week, ensuring you don’t forget anything important. You could also use it as an opportunity to write something you’re looking forward to during the week. It could be a much-needed night off from the kids, or a fun family get-together. Focusing on something you’re looking forward to will fill you with anticipation, rather than dread, for the week ahead. Finally, you can also include a loose schedule for the week. It’s a great way to stay organized and ensure your time is spent more wisely. For example, if you tend to be more productive and motivated first thing in the morning, schedule to take care of chores or preparations for the day as soon as you wake up. That way, you have the rest of the day to simply relax and spend time with baby. As useful as it can be to do certain things on a Sunday, many parents make the mistake of trying to do too much. As it’s often the only real day-off, or rather the least hectic parenting day, it’s common to leave everything until Sunday. This isn’t a good idea at all as you’ll end up feeling stressed out on the one day you should be relaxing. Then, what’s going to happen is you’re going to wake up on Monday feeling like you haven’t really had a break. It’s really important to find a balance between prepping for the week ahead and enjoying a little relaxation time. In particular, you should never leave all of the laundry until Sunday. As any parent of a baby or toddler knows, they go through clothing pretty quickly. There are always spills and stains to worry about so if you were to leave all of the laundry until Sunday, you’d quickly find yourself waist-deep in dirty clothing! Overall, doing certain tasks on a Sunday can make a massive difference to the rest of your week. Even if you just do one thing from the list above, you’ll find it really makes parenting easier during the week. Have any tips of your own to share? We’d love to hear them! Absolutely amazing advice. I personally do the cooking meals. I learned the hard way that cooking fresh meals is simply impossible sometimes when you’re trying to juggle a toddler and a career. That is why I’ve begun cooking meals ahead and then putting them in the freezer – I do this every single Sunday and I can’t tell you how much times it truly saves! I’d highly recommend it to all the busy parents. Great to know you’ve already been applying or practicing the tips here, Jane. It really works if one plans ahead. It would save moms a lot of hassle and stress for the coming week, and this is really the goal — to make things easy for everyone, not just moms. These are really great things for parents to consider to make their a little less stressful than it usually is. It is common nowadays for both husband and wife to have their own work to have a better financial support for their family, but this also means lesser time for the children and attention on house chores. Delaying everything until Sunday would not only increase their work load, but would also lessen their family time, and I say this from experience. Planning and organizing the what-to-do’s ahead of time would make it easier for the parents to do everything that they’re supposed to, while still being able to relax on their weekends and have fun with their family. These are great ideas! I think your doing a wonderful job of sharing your knowledge about family care taking with the world. Your tips and advices are a true asset to many people’s lives so I just want to thank you for that. Great point there — delaying everything until Sunday would really shorten the time they can spend with the family. After doing all chores, they’ll be surprised how time flew and that they didn’t get the time to spend some precious moments with the kids and their partner. So plan ahead for the whole week, it really helps. Good tips and advices on making your days more flexible and less chaotic with both chores and the kids. Planing ahead is definitely the best way to make things more organized. Am not a parent but am the first child out of five. I’ve seen how confusing and chaotic the house was when I started having younger siblings. My parents were always up and down especially mum being disorganized every now and then. This is a must read article for every parent. They are absolutely great recommendations. All that mentioned above about the “5 Things to Do On Sundays to Make Parenting Easier during the Week” was absolutely true. However, I work from Monday thru Saturday full-time therefore I only do my laundry every Sunday. I admit by doing this on Sunday, I feel tired and stress and I feel that I don’t have rest day at all. I do planning the weeks outfit’s and meals since I my kids go to school and my husband and I go to work but I don’t have a weekly planner. However, after reading the number 4 “Fill in the Weekly Planner” it make sense and I will do that from now on. This is my first comment to this site and I’m a newbie in this blog and I must say that one of the good things that I’ve done today is to register in this site. As a mother and a parent this is the right blog for me so far. 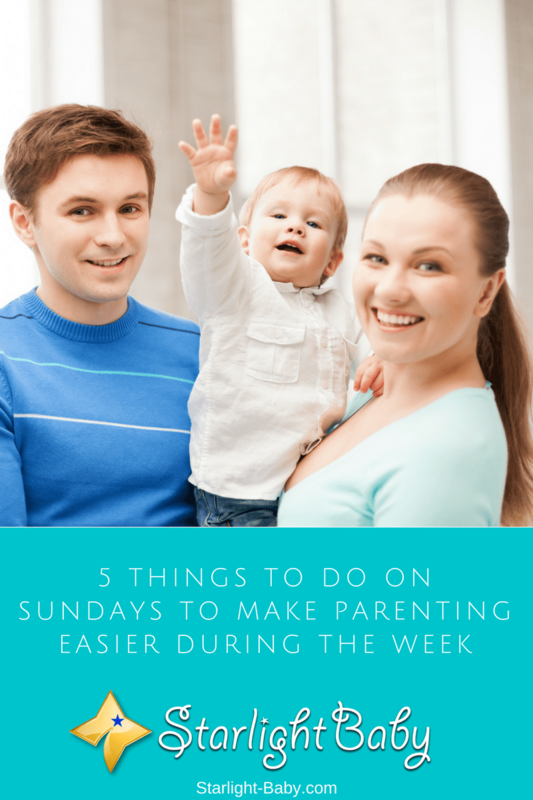 Day by day, you keep teaching your members on the blog ways that can assist in making parenthood an exciting and you just did again with such a well-analyzed points on how to make our Sundays worthwhile. You see, I could recall those days while we were small that mum would always cook series of meals and pack in the freezer to make sure we don’t have issues with finding what to eat during the week. Al we always do is to bring the soups and stews out during the weekdays and microwave them and enjoy our meals. Your point about using Sundays to plan the week’ s outfits as well as performing other tasks that are needed at the home is quite correct, and I gave you thumbs when you used the fifth point to further state that it is wrong to leave all home chores for Sundays as well. Nice article from you once more. This tips are awesome and applicable for busy parents. Parents must set their minds that they have to be responsible and accountable on their kids, and this tips may help them to be prepared to have a perfect weekend fellowship with their kids. Some parents are to busy on their jobs to the point that they don’t have much time to spend about planning their weekend family outing or just a simple indoor or outdoor bonding resulting unsatisfied husband or wife. With this kind of blog that we can read and learn in this website “Starlight Baby”, i think those busy moms must have a spare time to read tips and blogs about handling families. The need of a Home is not just material matters or financial stability. Parents must know their role character inside of their home special parenting their Children. Parents must build relationship, trust and love to their children. I wholeheartedly agree with all of these tips! Even if I don’t prepare the meals for the week ahead of time I make sure to have a weekly meal plan written out. Often the hardest part of weeknight meals for my family is simply deciding what to eat for supper. If I at least have the meal plan done then I can have the meat in the fridge to thaw and have easy meals planned for those nights I know we’re going to have to eat and run. Another tip that I’ve learned throughout the years is to prep my fruit and vegetables as soon as I get them home from the farmer’s market or grocery store. That way they’re all ready to snack on or use for meals when needed instead of grabbing something else that’s not prepped and probably not as healthy. I’m going to try out your idea of doing a “power clean” this upcoming weekend with my kids, and see how they like trying to get as many family contributions done in 30 minutes as they can. Thanks for the ideas! Great!!! Impressive ideas. This gives us parents on tract while at the same spending quality time with our baby. We may not be able to do everything on the list but we try to make sure that we get to accomplish a few before the week ends. Parenting is not an easy task it is one big responsibility once you get into it and the only effective way to organize everything is to set your plans ahead not only in weekly tasks but that includes the future that your baby lies ahead. So take my advice sit down and take time to plan. This make parenting a little more easier. I love this list because it is incredibly important one. I don’t usually get my clothes around but we plan the kids because they take forever. And I don’t necessarily make or prepare for the meals, but I try to plan them at least. And shop for the ingredients to save the daily store runs, which saves time and stress. I used to use the planner pretty regularly but I have found over time that the formats of the ones I have always used just do not help anymore. I have too many little things to carry, the planner, the mileage log, the expense tracker, the note book, the to do list, the coupon book, the receipts I have saved from the week, and even more sometimes. I have been working on creating a planner in a format that will fit all of my needs and can be assembled to be in one book, and easy to have with me at all times. Cleaning is a big one too. I try to start every week with a clean house because it just makes me feel less pressed for time. I don’t feel like I am going to get all this time sensitive stuff finished and then still have to do more. When I can come home to a clean house it’s easier to come home and relax. And for the sake of not having to get everything done on Sundays and overloading my schedule and brain, I stretch the cleaning out over the weekend, and the whole family has to help or not join the family fun times we have planned. For them, that punishment is the worst of them all, even if it is only movie night at home, mom worked like crazy and didn’t have a whole lot of time to sit down for fun time til recently, so they are eating up the opportunity for quality time while they can. I think that another very important and essential thing for Sunday, is to find something relaxing or meditating. Do something that you feel is self caring. You have to make sure whether, you went and partied, or took the family to some event or you ran errands, no matter what you did all weekend, you need to rest a little. If you don’t take that time, then you start to feel drained over time, until eventually you break. You work hard for your family, you take care of work responsibilities on and off the clock, you do everything for everyone you care about, and sometimes it gets to the point that point that you feel like you take care of everyone but you. Save that stress and take an hour to care for no one but you so that you don’t lose hours, days, and weeks to the mental issues that it can cause later if you don’t. Great ideas! These will surely help us, parents, to maximize our time while doing the house chores and keep with our babies. Cooking fresh meals for our kids is kinda tough but it will guaranteed our kid’s health and safety as we prepare their foods and let them enjoy what we made for them. Thank you for sharing your thoughts with us! In addition to the above I things, we also use Sundays to get the toys back in their place. Normally, throughout the week we do not get the time to organize the toys as well as baby accessories. That is why, we use Sunday as the day to tidy up our home as well. Even though, from the moment we put things back in their place, our toddler starts moving them around but we often do not get time throughout the week to tidy up the place again and again. That is why, we use Sunday as the cleanup Day as well. This here is awesome! I love it! I am literally sighing in relief. This definitely makes my life so much easier. I will not be running around like a maniac with a broom, and mop consistently or doing the things that I have been doing since my son started being mobile. One of my main problems is that I tend to leave the cleaning for the weekend. I am horrible about that. I will sit down and create a list of things that need to be done around the house and at one point, I had it worked out that I worked on a different room/s Monday through Friday. I stuck to this schedule and it worked out really well for me. It all went sideways when our family got the flu. It threw my cleaning schedule off and I was never able to get back into the routine. Now, I stress weekly about all of the things that need to be done. Thank you for the tips and advice. Those were great tips for Sunday but not for me. Sunday is free day. Not totally free though we also need time to relax a bit and enjoy. Go to church, eat together with the family, walk along the park or any activities that You and your family enjoys. Clothes: They can be washed during weekdays so it won’t bother you on Saturday and sundays. Daily clothes can be prepared night before the baby or toddler is going to use it. Better let her choose her own clothes. Everything will be just fine and you’ll work fast if the things are organized and clean. Meals: Yes you can plan the whole week meal, keep it, and try to cook same dish again next time so won’t keep on thinking on what new or different foods to be given. Cook some easy meals like 1 pot dishes. The simple the dishes are the more you can save time. You can do the marketing weekly but be sure you have a huge fridge or you can do it daily so you can also exercise along with the toddler and she’ll be used to going out under the sun and other people, bonding with her. Planning is good. So you’ll know your priorities and you’ll not be always in a rush. Manage your time well, and make some time to rest. After all you’re taking care of your whole family, so, might as well take of yourself. Save as much time as possible. Work fast and efficiently. Keep everything available and ready.